EUGENE PETERSON, best-selling author of The Message, was convinced his paraphrasing translation of the Bible would fail. A Seattle Pacific College graduate of 1954 and longtime professor, pastor and author, Peterson took on the task, in part, to appease a persistent NavPress editor. The editor had read Peterson’s paraphrase of Galatians in his 1982 book, Traveling Light, and wanted more. Eight years later, Peterson finally agreed to translate 10 chapters of the Gospel According to Matthew, but stopped after translating four. “It was as bad as I thought it was going to be,” Peterson says wryly. “It was just awful — wooden, stilted and contrived.” Believing the task futile, he skipped to the Sermon on the Mount “just to have fun,” he recalls. Then something happened. “I found my voice,” he says. Millions of readers agree. 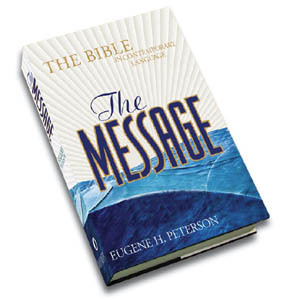 In 1993, NavPress released the New Testament portion of The Message. To date, seven million copies of it and other portions — including The Prophets, Psalms and Proverbs — have been sold worldwide. The Message was released in its entirety, Old and New Testaments together, this summer. A 10-year undertaking, Peterson began writing The Message after retiring from a 29-year pastorate at Christ Our King Presbyterian Church in Bel Air, Maryland. Invited to be a writer-in-residence at Pittsburgh Seminary, he launched the New Testament in earnest, finishing at Regent College in Vancouver, British Columbia, where he served as professor of spiritual theology for more than five years. When the popularity of The Message soared, the publisher asked him to continue. He completed the Old Testament at his and wife Jan’s rural Montana home. “She won’t talk to me,” says Peterson about Kjos. “And NavPress has tried to talk to her, just to have a conversation, but she won’t do it.” Always willing to discuss word and phrase choices, Peterson had prominent biblical scholars check the paraphrase as he worked.